Alley Cats Strike! | The Only Way to Settle The Score Is To Take It To The Alley! The Only Way to Settle The Score Is To Take It To The Alley! On June 26th, 2014, Ben Blatt wrote an article on Slate called The Longest Movie Plot Summary on Wikipedia. At the time, that record belonged to Alley Cats Strike! with a synopsis weighing in at 4,266 words. Since then, the synopsis on the Alley Cats Strike! Wikipedia page has been edited to be in line with the site’s standards. Below, however, I’ve reprinted the longer synopsis because that much work shouldn’t disappear. 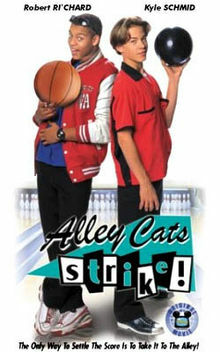 Also, I’m a little biased – I’m Greg Pincus, the screenwriter of Alley Cats Strike! – and, hey, I don’t think the movie’s of no cultural importance! So, here is the once upon a time longest Wikipedia movie summary (reprinted with the hope that none of the authors of it will mind or will let me know by comment, tweet, or another way if they do). The East and West Appleton Jr. High Schools (the Wolfpack and the Wildcats, respectively) compete yearly for the Mighty Apple trophy. At the beginning of the movie, the West is trailing in the race for the Mighty Apple by one, with the big basketball game about to take place that night. A pep rally takes place at the West Appleton school, where Todd, the star of the basketball team and the most popular kid in the school, promises he won’t let the school down and will tie up the race for the Mighty Apple. Alex, Elisa, Delia, and Ken, who are seen as outsiders because of their love of bowling and propensity for wearing retro clothing, greet this proclamation with sarcasm, indifference, and annoyance. Ken informs the others that he will be late to arriving at the bowling alley (which Alex’s dad owns) tonight, because his dad, who is crazy about the Mighty Apple rivalry, is forcing him to attend the basketball game. That night, Alex, Elisa, Delia, and (later) Ken are shown bowling at Big Apple Lanes, with Alex’s dad watching over them and running the alley. The alley is shown to be somewhat rundown, due to bowling’s lack of popularity, and there is talk that Alex’s family may have to sell the alley. Alex is shown to be quite adept at fixing the mechanical problems that crop up, which his father appreciates since there is no money in the budget to pay for repairs. Only Alex’s dad, Kevin, has any interest in the outcome of the basketball game, as he listens to Sweet Lou’s broadcast of the game on the radio. Todd wins the game for the Wildcats by swishing a last second shot, which ties up the race for the Mighty Apple. Since the schools compete in an even number of athletic events, the special “tiebreaker” clause has to be invoked for the first (and last) time ever. This concerns Mayor McLemore, mayor of West Appleton and Todd’s dad. The next day, it is revealed that the tiebreaker athletic event will be bowling, as this is the only sport in the acceptable tiebreaker sports that both schools have teams in. Additionally, the rules of the tiebreaker state that only students who signed up for the Bowling Club at the beginning of the school year are eligible to compete (to prevent the schools from stacking the teams with ringers at the last minute). This worries Mayor McLemore further, as this means winning the Mighty Apple is dependent on Kevin Thompson’s kid. At this time, it is implied that Todd and Alex’s fathers have had a major falling out in the past related to baseball, but none of the children know what they’re talking about. West Appleton Jr. High’s principal (Principal Morris) is also very worried by this and frantically searches for the list of members of his schools bowling club with Ms. Johnson. To his relief, he finds that, in addition to Alex, Elisa, Delia, and Ken, Todd McLemore’s name is also on the sign-up sheet for the Bowling Club, which makes him eligible to compete (Alex, Elisa, Delia, and Ken are stunned and amused to hear that “Golden Boy” is part of their Bowling Club, since they are the only people who ever show up to Bowling Club). Todd is flabbergasted by this news, as he never signed up for bowling club (he finds out a short time later that Leo and Flip signed him up as a joke). This means that, in order to win the Mighty Apple, Todd is forced to co-exist and work with Alex, Elisa, Delia, and Ken, people he views as losers. Alex, Elisa, Delia, and Ken are shown discussing this turn of events at Nancy’s old fashion diner, their second favorite hangout spot (after the bowling alley). During this sequence, it is revealed that West Appleton won the coin toss, so the event will be held at their home alley, the alley Alex’s dad owns. Despite his prowess as an athlete in many other sports, Todd’s first few bowling sessions with the others show him to be a very poor bowler, mostly due to his propensity to overthrow the ball. Around this time, the tension between Mayor McLemore and Kevin Thompson continue, although the kids still have no idea why they are so angry at each other. Of course, Alex, Elisa, Delia, and Ken are delighted by this change in events, as they enjoy seeing Todd, the Golden Boy, knocked down a few pegs. Still, they offer him advice on how to improve as a bowler, but Todd repeatedly rebuffs them, claiming he just needs to practice and doesn’t need their help. At the same time, Todd derides the others attitude, telling them that they need to want and expect to win like him (the others view this as overconfidence). At this point, it seems extremely unlikely they Todd and Alex, Elisa, Delia, and Ken will be able to set aside their differences for the greater good. In the meantime, Mayor McLemore and East Appleton’s Mayor Hanburger are ratcheting up the stakes for the bowling match. First, they bet 40 gallons of apple cider (West) versus 40 apple pies (East). At school, Alex catches up with Todd and offers to help him become a better bowler. Todd responds by offering to bring Alex to a party at Lauren’s (a popular girl in school) tonight. To this, Alex responds by stating that he’s doesn’t need or want pity or party invites. In the meantime, Lauren approaches them and invites Alex to her party tonight, which Alex accepts. This cements Alex’s offer to help Todd improve as a bowler, although Todd chafes at Alex’s demand that he (Todd) wear a retro bowling shirt with the name Dirk on it. Alex responds by saying that “you’ve failed lesson one” (wearing the appropriate apparel). Alex and Todd are next seen at Lauren’s party. Alex is seen as an outsider at the party, partly due to his retro clothing. Alex feels uncomfortable at the party, as the only people he knows are Todd, Leo, Flip, and Lauren—people who have never considered him a friend—and the music is not the swing-style music he and his friends enjoy. When Alex leaves the party early, Lauren expresses relief that he’s left and she and Todd begin to dance. It is implied that Lauren and the others are only being nice to Alex because Alex is the best bowler in town and they need him to win the Mighty Apple. On the way home, Alex stops at Elisa’s house and apologizes for missing bowling that night. He initially lies about his whereabouts, but soon comes clean and admits he was at Lauren’s party. Elisa is shocked and asks him if he even knew anyone at the party (which, of course, he didn’t, since he doesn’t count Todd, Lauren, and especially Leo and Flip). She shows him her score from that night, which is a 220. He apologizes for missing this great round and promises he’ll be there when she bowls a 300. She asks him to promise that she won’t lose him to the popular crowd. Next, Alex, Elisa, Delia, and Ken teach Todd how to bowl with “style,” which they deem necessary to becoming a good bowler. At the end of the training session, Todd tells the others that he never realized that bowling could be this much fun, and that if they showed everyone else this side of bowling, then it would be much more popular and there would be many more customers at the alley. Alex doesn’t seem too interested in this, because he likes bowling because it’s not the most popular thing to do, but he realizes his family need to do something to improve the fortunes of the alley or they’ll be forced to sell it. After this point, Todd is shown as continually improving as a bowler. His only major weakness is converting 7-10 splits, which he repeatedly attempts but never successfully converts. Nevertheless, he proclaims to Alex that, when the big day comes, he will convert the shot. In this time, Todd confronts the other four about their not wanting to win. The others defend themselves, saying they want to win, just not in the same way as Todd (i.e. have fun and win, not win at all costs). Ken is especially vocal, pointing out that his dad has always dreamed of him competing for the Mighty Apple, but up until this point bowling wasn’t one of the sports that East and West Appleton competed in during the battle for the Mighty Apple; as a result, Ken is facing an intense amount of pressure from his father. He tells Todd that if he thinks they don’t care about winning, he’s dead wrong. In the end, this helps Todd and the others come to terms with one another and they begin to become a little more like a team. Meanwhile, in East Appleton, Mayor Hanburger is shown greeting a bowling coach to help prepare his team. The coach is not named or seen from the front at this time. Over the next few weeks, Todd continues to improve as a bowler and the group hatches a plan to attract more customers to the alley. Delia christens the event the “Bowling Ball” and Alex and Todd set to work on advertising for the event, which will be held the next Friday night (and weekly or semi-weekly thereafter). At this point, Alex tells Todd that the bowling alley doesn’t have any money to buy supplies or accessories for this event, to which Todd replies not to worry. Todd uses his charm and status as the most popular athlete in town to get various local businesses to donate paint, lights, printed flyer’s, and other supplies to him (and thus the alley). During this time, Todd tells Alex that the confidence he shows in public is an act, as Todd believes that it’s important to make other people think you’re going to win, as it rubs off on them and gives them confidence (and also doesn’t show weakness). In meantime, after another practice session, Todd and Alex decide to spy on the East Appleton team, to scout them. They find that the East Appleton team is stacked with ringers from other sports. Additionally, they are coached by “Whipsaw” McGraw, a PBA (professional) bowler, who has molded them into extremely good bowlers. Todd greets this discovery with concern, while Alex is confident that they won’t bowl strikes every time (despite them bowling only strikes while they’re watching). Todd bails, not wanting to watch any more. This proves to be fortuitous, as the East Appleton team spots Alex spying on them just after Todd leaves. Todd is able to extricate Alex from the East Appleton teams clutches by claiming that he told Alex not to spy on the other team and telling the East Appleton team that he will deal with Alex personally. Once they are outside of the alley, Todd releases Alex and starts joking with him, which catches Alex off guard. Around this time, Alex’s dad confides in Alex that he applied for his real estate license the other day, and may have to sell the alley if things don’t turn around. This pushes Alex further into working with Todd, as he believes that the “Bowling Ball” event will be a big boon for the alley and hopefully help save it. Previously, he had mentioned to Alex and that he (Kevin) and Mayor McLemore used to be best friends. When Alex mentions this to Todd, Todd doesn’t believe him. In the meantime, Principal Morris has booked some radio time with Sweet Lou for Todd. He told Sweet Lou that Todd is the captain, which upsets the other four. Todd responds by telling them that Sweet Lou is expecting him, so he can’t not go, and to elect a co-captain who can accompany him to the radio appearance. Elisa, Delia, and Ken elect Alex, on the condition that he come by the diner afterwards and tell them all about it. During the radio event, Todd is his typical brash, confident self. Alex is less confident than Todd, but still gives up beat, positive answers about their chances of winning, showing that some of Todd’s attitude has started to rub off on him. Afterwards, Todd invites Alex to come hang out with Leo, Flip, Lauren, and the other popular kids, which Alex accepts and blows off his true friends in the process. After waiting for Alex to come to the diner until closing time, Ken offers to walk Elisa and Delia home. On the way, they see Alex partying with the popular students, which upsets them. The next scene shows the group at practice, where Alex is struggling with his shots while Todd is doing really well and continuing to improve. Elisa tries to comfort him, but Alex’s attitude remains negative. It gets worse when Elisa reminds him that he blew them off last night, which Alex feels really bad about. Their bickering ends when Alex’s dad Kevin asks them to stop bowling so the preparations for the “Bowling Ball” can begin. Next, the “Bowling Ball” event occurs and is shown to be a huge success financially for the alley. Alex, at his dad’s request, blends in with the popular crowd that has attended the event, even changing out of his retro bowler clothing into an outfit very similar to the ones Todd wears. However, Elisa, Delia, and Ken leave early, as they view Alex as abandoning them to be with the popular crowd (just as Elisa feared earlier) and dislike the fact that the alley has been turned into a flashy, loud place with non-swing music. After the event, Alex is taking out the trash when he overhears (from around the corner) Lauren, Leo, Flip, and other popular students talking about how they dislike Alex and will stop pretending to be his friend once the bowling event is over. This hurts Alex deeply, as he had just starting feeling accepted by the popular crowd for the first time in his life. In practice the next day, Alex’s bowling continues to get worse, as he is now mired in a deep funk over what he heard the previous night (especially when combined with the fact that his true friends are angry with him). During practice, Mayor McLemore and Principal Morris stop by to give the team shirts for the event. The shirts are shown to be low-quality t-shirts that indicate how lowly the town holds the bowling team. At the same time, Alex, Elisa, Delia, and Ken out from Todd that the mayors have increased the stakes for the event even higher—the winner of the event will now get to name the new middle school in addition to the previous bets. All of this information makes Alex snap and he quits the team and storms out. The others immediately blame Todd for corrupting their friend. At this point, the West’s odds of winning the Mighty Apple are starting to look very bleak indeed. The night Todd goes to Alex’s house and talks to Alex and tells him that he’s sorry for what’s happened. He also says he’s surprised at how good of friends they’ve become, and how much he enjoys bowling, despite his initial bias against it. Finally, he thanks Alex for teaching him that sports can also be fun, not just an intense, win at all costs thing. He asks Alex to please return to the team, and that tomorrow at the event, they’ll just bowl for fun, win or lose, stating that if he’s driven Alex away from his passion, bowling, then he won’t be able to have any fun. He then reveals that he’s created new shirts for the team for tomorrow, which are retro-style bowling shirts with the name “Alley Cats” on the back. On the front, Alex’s shirt has the name “Tex,” because Todd says Alex “looks like a Tex.” Todd’s shirt has the name Dirk, in reference to the shirt Alex insisted he wear earlier in the movie. After saying their goodbyes, Alex’s dad comes outside and talks with Alex. He reminds him that bowling is still fun, even if it’s not quite what he wanted it to be. He also tells Alex the story of the falling out between Mayor McLemore and himself. They used to be best friends and were the shortstop and second baseman on the West Appleton Jr. High baseball team. Like Todd, they both wanted to win the Mighty Apple really badly. In the bottom of the ninth, (according to Kevin) Mayor McLemore made a bad throw (error) where making a good throw would have ended the game by allowing them to complete a double play. According to Mayor McLemore, Kevin dropped the ball. This event and wanting to win so badly tore them apart and they were never friends like they had been before it. At the time, they blamed the Mighty Apple for this, but Kevin realizes now that this isn’t the case. He uses this as an example to Alex about wanting to win, but not at all costs, because letting this tear him and Jeff (Mayor McLemore) apart was the stupidest thing to ever happen to either of them. The next day, Alex is nowhere to be found, but the others have gathered for the big event. The atmosphere is crazy, and there are even more people in attendance than there were for the “Bowling Ball” event. The mayors introduce the event, the Mighty Apple, and then the teams. First, the Wolfpack are introduced to boos. This surprises Elisa, Delia, and Ken, as they’ve never heard bowling in a bowling alley before. They question why so many people would want to see them bowl. At this point, Alex makes his triumphant return and tells them people want to see them “because our uniforms are so darn cool!” After this, the Alley Cats enter the alley to a raucous partisan crowd. The Alley Cats win the coin toss and elect to go second (their order: Ken, Elisa, Alex, Todd; Delia is their substitute). Various shots from both teams are shown from the first 9 frames; the majority of them show both teams getting all strikes or spares, with the exception being a shot Todd has where he (again) fails to convert the 7-10 split. Additionally, Ken’s father is shown as being extremely proud of his son, who is finally competing for the Mighty Apple like he’s dreamed of. Heading into the 10th frame, the East is ahead but the West is working on more marks, which gives them the opportunity to come back and win. Alex needs to get 3 strikes. Under immense pressure, Alex gets the first strike. Before taking his next shot, showing how much fun he’s having, he jokes with the other Alley Cats about if he should take his next shot between his legs or other various methods. They implore him to go bowl and stop fooling around. He then successfully gets the second strike. Finally, with all the pressure on him, he successfully converts the third strike. His success means that the final East bowler (Baron) needs to get 3 strikes to force Todd to make at least a spare to win. Baron successfully obtains 3 strikes, putting the pressure on Todd. With Sweet Lou crooning about how lucky the East is to have Todd McLemore coming up in this pressure situation, he smiles and acts confident towards the crowd, but then kneels down and confides in his new friends and teammates that he wishes they hadn’t gone last so this pressure wouldn’t be on him. Everyone, especially Ken, tells him that it’s no sweat, since all he needs to do is get a spare. Todd approaches the lane and fires a perfect shot, but unfortunately a 7-10 split occurs! With that, Delia approaches the lane for the climactic shot. However, instead of taking a traditional approach and bowling, she instead kneels down at the edge of the lane and puts her finger in the ball. After spinning it in place a few times, she gives the ball a gentle push down the lane. Everyone in the crowd, including both teams, are stunned and unsure of why someone would pursue such a strange tactic to converting a 7-10 split. As the ball slowly rolls toward the pins, Delia gets up and walks away, not even looking at her shot on her way back to her seat and expressing complete confidence. After she sits down, Todd asks her if she’s ever tried this shot before, to which she smugly replies (as earlier in the movie) “Wouldn’t you like to know?” The ball continues to meander down the lane towards the pin. Meanwhile, Sweet Lou is nearly having a heart attack on the radio describing how slowly the ball is moving. Finally, the ball hits the 7 pin, which spins into the 10 pin and knocks it over. This gives West Appleton a spare, the win, and the Mighty Apple! This sets off a wild celebration for the West. Alex shares an emotional hug with his parents and tells them he’s glad bowling is still fun. Todd shares a hug with his parents, and his Mom makes his Dad apologize for heaping too much pressure on him. Todd tells his Dad that bowling has taught him how to enjoy sports and not see them as just “an intense, gotta-win game.” While Todd still wants to win, he now sees fun as also being important. His dad begins to celebrate the fact that the new school will now be named West Appleton Jr. High, but Todd tells him it’s not fair that someone loses their identity over something as fun as bowling, and that the Alley Cats should get to decide the game since they won and he (Mayor McLemore) didn’t. While this initially confuses Mayor McLemore, he eventually acquiesces and tells Mayor Hanburger that they’re not going to name the school. At this point, Alex and the rest of the Alley Cats chime in and say that they are going to name the school, and that it will be named Appleton Central. Given this attractive compromise, everyone ends up happy and both the East and West celebrate by bowling and dancing while swing music (including “When the Alley Cats Strike” as part of the lyrics) blares in the background. Alex tells the audience that these events have taught him that if you have an issue with someone, they should settle it—in the (bowling) alley! The above text is re-used from Wikipedia licensed under CC-BY-SA. The Wikipedia page for Alley Cats Strike! can be found here. A list of all contributors to the Wikipedia summary re-used above is here.